Thanks to a wonderful neighbor (thanks, Brett! ), I am now the proud owner of my first set of antlers. Real antlers. Now that I have them, I’ve been scouring the internet for ideas on how to display them. I’m also undecided on whether to paint them or leave them au natural. My oldest brother is an antler collector of sorts, and I kindly put in a call to him yesterday to ask him to bring me a few sets when he comes for Christmas. 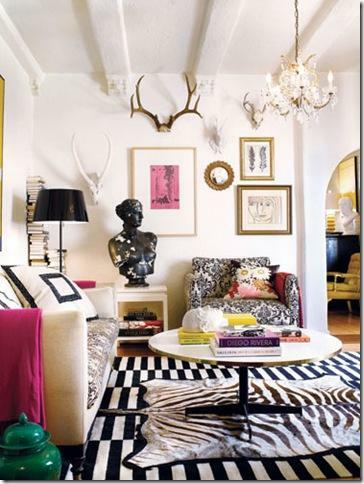 Then maybe I can entertain the idea of an antler collage in my living room. Or better yet, a set in each room. Hi Natalie! I just found your blog over at Knack from her antler post. Since I can't do (most) of these fun things with my array of antlers I have to get creative. I can't paint or bedazzle antlers b/c my hubs would divorce me lol! I have them strewn about the house hanging on things or on top of books/magazines, jewelry hangs from some of them and then I have two in my studio space (I redo furniture too!) that have vintage twine spools sitting on the antlers. Anyways I wanted to say 'Hello!' and I'll be browsing around your blog some more! Awesome job on the projects you've done they are beautiful! I can't wait to see more! Definitely floral antlers! I think that's the only way I could handle them myself. I actually really like the floral antlers too, especially if you leave them natural (which I think you should since you have the real deal). I have seen a lot of people displaying fake glossy antlers mixed in with wall art, and I also like that look. Can't wait to see what you do! Love the blog as usual.